Sheikh Hani was born in 1974 in Jeddah, the Kingdom of Saudi Arabia. He is currently the Imam and the Khatib of Al-`Anani’s mosque in Jeddah. 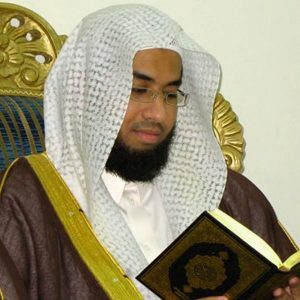 He is well-known for his unique voice filled with emotions and that attract a number of believers to listen to his recitations of the book. Sheikh Hani grew among a conservative family that accorded much importance to the learning of the Quran. He had much respect for his parents and older brothers and sisters, who served as role models for him. By the age of 12, Sheikh Hani Ar-Rifai has completed the memorization of the Quran. During his learning of Quran, sheikhHani has encountered other well-known sheikhs such as Sheikh Muhammad `Ashishi, Sheikh Ali Jabir and Sheikh Muhammad Yusuf. He specialized in Islamic Studies in King Abdulalaziz University and studied under the supervision of the best scholars and sheikhs such as Sheikh `Abdullah Ibn Baiah, Sheikh Khaldoun Al-Ahdab and Sheikh Ali Jabir. Moreover, Sheikh Hani Ar-Rifai was elected a special reciter of the Quran in the royal court by the Saudi Ministry of Culture and Information. He was also chosen to be the personal reciter of King Fahd Ibnu Abdelaziz Al-S`aud since 1998 till his death. From 1998 till 2002, the sheikh worked as a teacher of Islamic Studies in different public schools in Saudi Arabia. He was then appointed the director of the legal affairs of King Faisal’s hospital and the Research Center in Jeddah. Moreover, Sheikh Hani participated in numerous religious shows reciting verses of the holy book or giving advice. He was broadcasted in different channels such as “Alfajr”, “Iqra”, “Almajd” or “Ash-Shariqah”.